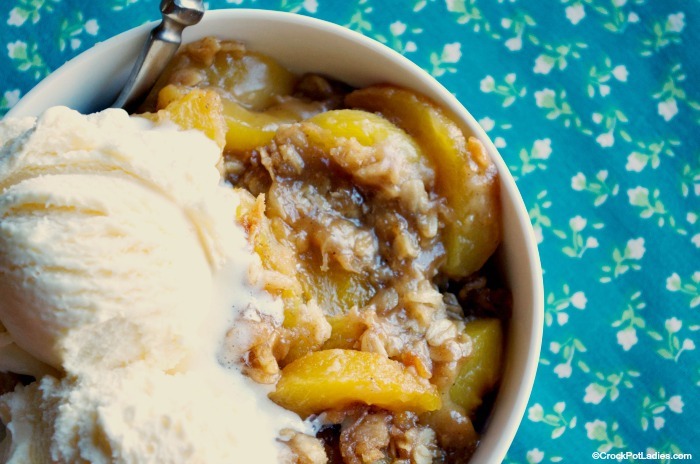 Take advantage of the seasons fresh peaches with this recipe for Crock-Pot Easy Peach Cobbler. This cobbler is super simple to make and tastes amazing plain or served with a scoop of vanilla ice cream. The perfect summer dessert! 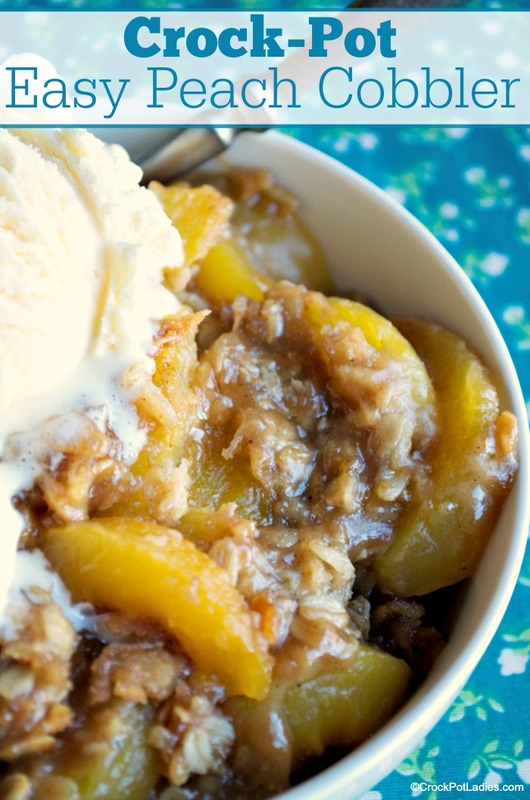 I first made this peach cobbler recipe back in 2012 for my mother whose health was poor. I traveled back to Utah with my children to spend a month with her and was privileged to make dinner for her each night. Something she thoroughly enjoyed. Growing up, my mom had a peach tree at her childhood home. And they all canned peaches every summer from that tree. As an adult, when my grandfather would travel to see my mom he had to see that old peach tree. Just to check up on it and see how it was growing. I now have my own peach tree growing in my backyard. And my family loves to can and freeze the peaches most years. However, Kansas weather is a bit more wild that Utah. So it can be a bit more hit or miss with how our tree produces. 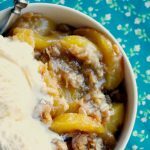 My children also loved this slow cooker peach cobbler too…although I suspect my youngest liked the vanilla ice cream the most. This recipe uses frozen peaches that you have either frozen yourself, or you can find in the freezer section at the grocery store. These will have far less sugar than canned peaches, and being frozen they will cook for the appropriate time without burning. You can also use fresh peaches and the cooking time will be the same. I used a smaller 4 quart slow cooker with this recipe, if you are using a larger slow cooker I would probably double the recipe so that this doesn’t burn. You’ll want to eye ball the mixture as it may not be done at 3 1/2 hours if you double the recipe. This is fabulous after dinner but will also work well for potlucks if you want to bring something a bit different. There is something about a warm peach cobbler topped with vanilla ice cream or whipped cream that screams summer! Use frozen peaches you have frozen yourself or store bought or fresh peaches works too. No adjustment in the cooking time! In a large mixing bowl; combine together all of the dry ingredients. Add 6 tablespoons of the melted butter to the dry mixture and combine until it resembles coarse crumbs. Using the 2 remaining tablespoons of butter, butter the sides and bottom of a 3.5 or 4 quart slow cooker. Add 1/4 of the dry ingredient mixture to the bottom of the slow cooker and spread evenly in a single layer. Add the peaches to the large mixing bowl that contains the remaining dry ingredient mixture and toss to coat the peaches in the mixture. Pour contents of the bowl into the slow cooker and spread evenly. Cover and cook on LOW for 3 to 3 to 3 1/2 hours. This recipe does best straight in the slow cooker. We tested this recipe using a slow cooker liner and it did not work very well. This recipe was first published in May 2016. And we have decided it was time for an update. New photos, as well as special diet and nutritional information has been added. We hope you enjoy! I get your emailed recipes and you have turned me into a gourmet chef. I made the Hawaiian bbq chicken tonight. It was delicious. I have told all my friends about you. I LOVE crockpotladies.com! Aww, thank you Chris! Thank you for subscribing to our newsletter and thank you for being a loyal reader! You are amazing! And I am so glad you enjoyed this recipe!